In a multiple murder case plagued by lies and deception, there is one terrible secret that defense attorney Dismas Hardy is duty-bound to protect. Even if the price is his client’s life. When Dylan Vogler, the charming manager of the popular Bay Beans West coffee shop in San Francisco’s Haight-Ashbury district, is gunned down near the store, inspectors are shocked to discover that his knapsack is overflowing with high-grade marijuana. It soon becomes clear that San Francisco’s A-list flocked to Bay Beans West for more than a pricy caffeine fix. Maya Townshend is the absentee owner of the shop—and the beautiful and extremely wealthy socialite niece of the city’s mayor. When she becomes Dismas Hardy’s client, he thinks it will be a simple hand-holding exercise until the police identify a suspect. But then another of Maya’s past acquaintances turns up murdered, and the newspapers begin to reveal the names of the coffee shop’s celebrity, political, and even law-enforcement clientele. Hardy begins to question how much his client knew about what was actually going on inside her business—and whether she was also Vogler’s lover. All the while, Hardy’s best friend, homicide lieutenant Abe Glitsky, sick with worry over his severely-injured youngest child, barely functions in his job. Without his supervision, his inspectors are prey to the machinations of the many power brokers with interests in the case. And ambitious prosecutors, both state and federal, close in on Maya. As her trial gets underway, Hardy discovers that Maya harbors an explosive secret that is at the heart of the case. Regardless, Dismas Hardy is hostage to that secret, and privilege-bound to protect it. 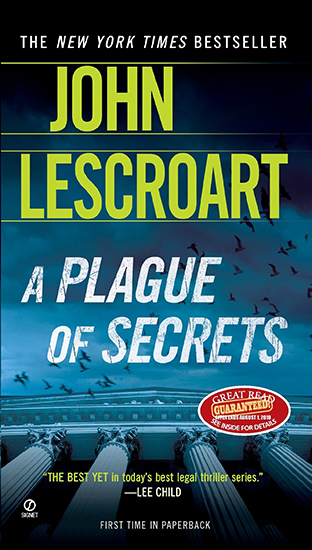 Perceptive, fast-paced and masterful, A Plague Of Secrets is sure to have fans and new readers of John Lescroart alike hungrily turning the pages.